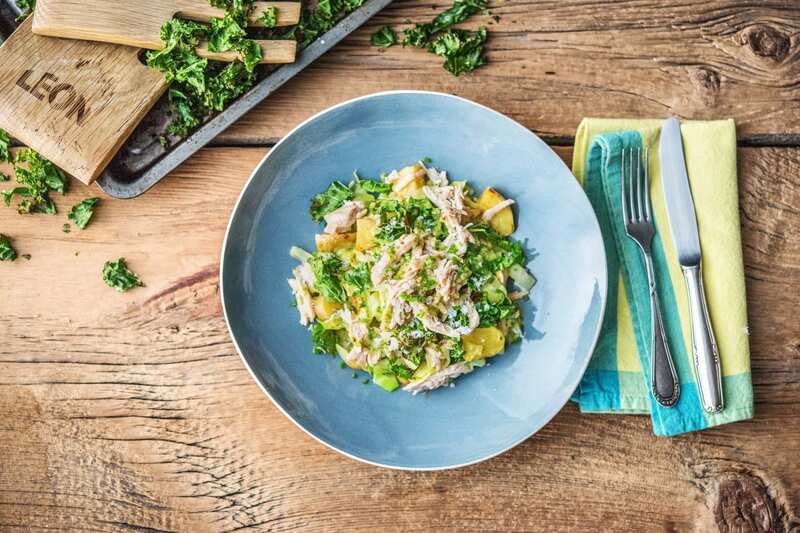 A recipe from Naturally Fast Food chain LEON, who’s seventh cookbook Fast & Free is out now. Although this does not use traditional Caesar dressing, the mustard and parmesan make it highly reminiscent of one. People really do hail the kale at LEON. Preheat your oven to 200 degrees and line a baking tray with foil. In a small bowl, mix together the olive oil (amount specified in the ingredient list), white wine vinegar, honey, Dijon mustard and a good pinch of salt and black pepper. Quarter the new potatoes (no need to peel). 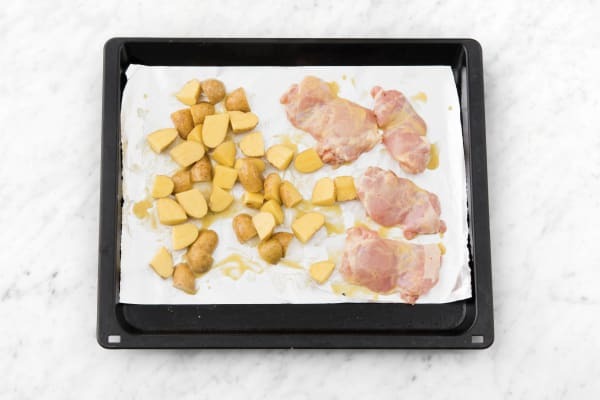 Lay your potatoes and chicken thighs onto the baking tray and pour over half the mustard dressing. Using your hands, them over in your dressing to coat them well and place on the top shelf of your oven for 20-25 mins. Give the tray a shake halfway through cooking. Tip:The chicken is cooked when it is no longer pink in the middle. While your chicken and potatoes are roasting, you can cook the spring greens. Bring a large pot of water to the boil, remove the tough root and roughly slice the spring greens. 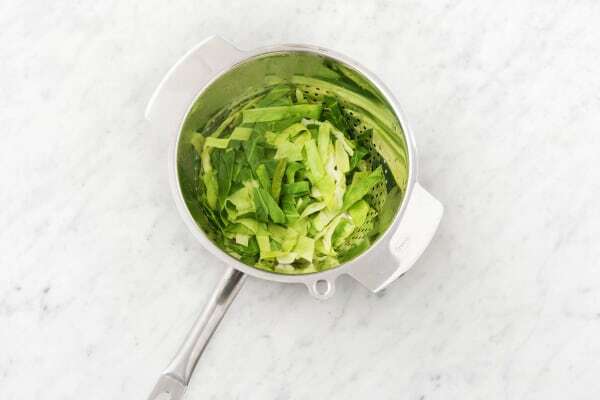 Pop them in a colander or steamer (if you have one), place a lid or plate over the top and steam your spring greens over the boiling water for 6 mins or until just tender. Remove the colander from the pot and leave to one side, uncovered. Finely chop the chives and grate the parmesan. Add half of your chives and half your parmesan to your remaining mustard dressing and stir to combine. When your chicken and potatoes are cooked, remove them (still in the foil) to a plate or bowl. Carefully tip any cooking juices, if there are any, into the bowl with the remainder of your mustard dressing. Turn your oven up to 220 degrees. 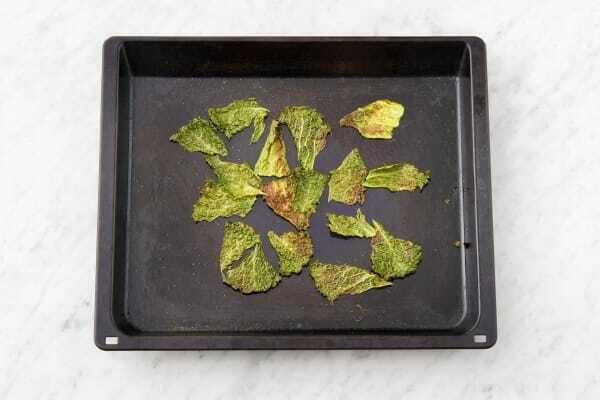 Using the same baking tray (now without the foil), lay out the kale and drizzle with 1 tsp of olive oil per person. Sprinkle with a good pinch of salt and black pepper, and bake on the top shelf of your oven for 5 mins or until slightly crispy - don't forget it or it will burn! 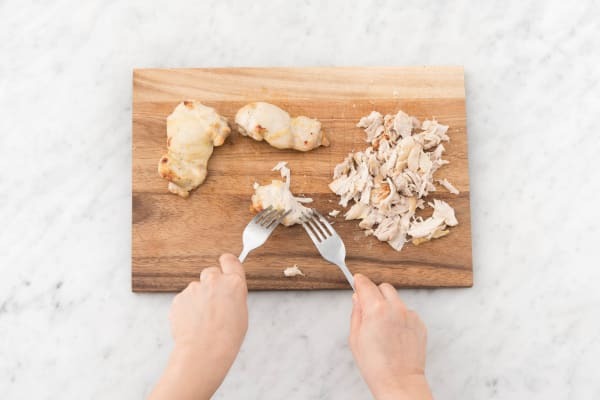 While this is cooking you can shred your cooked chicken using two forks (see picture). In a large bowl or on a serving plate, toss your spring greens and new potatoes with most of your mustard dressing. Tip your kale on top followed by your warm chicken. Pour over any remaining dressing and sprinkle with the rest of your chives and parmesan. Serve and enjoy!